KUALA LUMPUR: Minister in the Prime Minister’s Department Shahidan Kassim challenged opposition MPs to cut their salaries, too, if they wanted him to cut his to maintain the size of the civil service. “Cut my salary, no problem. “Let’s also cut all opposition MPs’ salaries. “Speaker, I propose a motion to cut all MPs’ salaries by 50%. “Do you (the opposition MPs) agree to this?” he said during an altercation with the opposition in the Dewan Rakyat today. 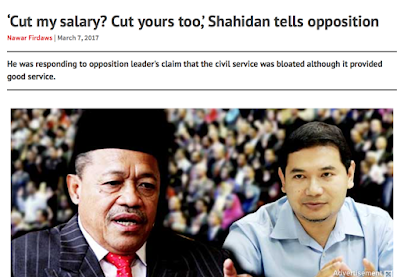 Shahidan was defending the civil service against opposition claims that it was bloated. Rafizi Ramli (PKR-Pandan) had proposed that Shahidan slash his own salary if he really wanted to maintain the current number of civil servants. Anthony Loke (DAP-Seremban) told Shahidan his party was not looking to halve the civil service. They were just concerned about its size at the moment, he said. Wong Chen (PKR-Kelana Jaya) supported this and reminded the Umno minister that the same claim was made by Second Finance Minister Johari Abdul Ghani. The argument erupted in the middle of Wan Azizah Wan Ismail’s (PKR-Permatang Pauh) debate, but she regained control of the floor after several minutes. She said it was undeniable that the civil service was bloated although it had provided good service. But Shahidan, who was still upset over the exchange, continued speaking even after the Dewan Rakyat session for today came to an end. Johari had said in January that the civil service had one civil servant for every 19.37 people in the country. A Borneo Post report said the proportion of civil servants to the national population in other countries such as Singapore is 1 to 71.4; Indonesia 1:110; Korea 1:50, China 1:108, Japan 1:28, Russia 1:84 and the United Kingdom 1:118. “In 2003, the pay of public servants totalled RM22 billion, but it increased to RM74 billion by 2016. “In 2003, the pension of civil servants was RM5.9 billion, and in 2016 the amount soared to RM19 billion,” Johari was quoted as saying. Get Shshidan to beg for money from Mat Maslan IQ 3.85 (2 million cheque from Bugis crook) or Shahrir (1 million cheque from Bugis crook). if a supposedly top news editor admire YB Shahidan over his almost childish manner in parliament debate "how seasoned Umno politician YB Shahidan Kasim schooled PKR strategic-something YB Rafizi", this editor himself must be at least several class lower in his own mental faculty. this only enhance and provide further confirmation to what is rocky's real capability! Ni Nazir monkey yg start kan? He listed n compared fuckgures from other nations. Dia lupe spt Singaporki banyak data tak dikira masuk spt Angkatan Tentera n polis etc not considered as civil servicemen. If these geng dtg balai polis or go to court, tak payah entertain, outertain je cukup. Dia ingat gaji MP n elaun n claim dia orang sape yg prepare?